At our hotel 10 comfortable rooms are available, all of them in a lovely flower design. All rooms are non-smoking and have shower, WC, TV and W-LAN. Dogs are not allowed in the hotel. We offer 4 rooms for two, 3 rooms for one person and 3 single rooms with a French bed. All prices are incl. taxes, without breakfast. 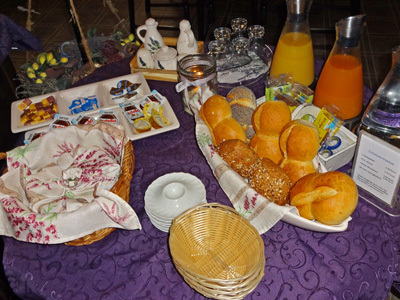 (Price for breakfast 7 Euro/person) You can book the breakfast separately by check-in.